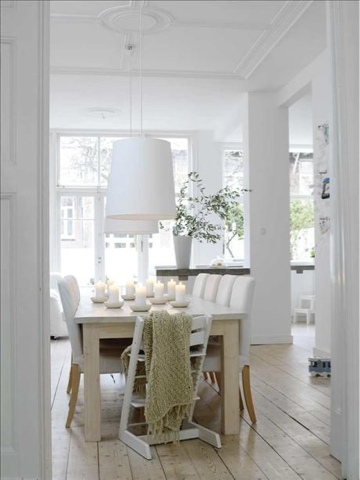 I've seen this white interior for the first time a few years ago in the Skona hem, VTwonen and Ikeafamilylive magazines. Has been one of my favorites since. I often think about the beauty of simplicity. White is pure and less is more. When i see this pictures i see all that. And i realize that it's actually possible to keep a white house clean, fresh and well organized while raising four children. This is what the Swedish Paula Eklund did in this house in The Hague, The Netherlands. I've lived 14 years in The Netherlands and i know how busy this country can be and how good it must feel when you arrive home and just feel serenity around you. 1. Simple colour scheme. It’s easy to maintain a white house if you keep a roller and a bit of paint handy. It also gives the house an order and calmness, while rougher finishes add texture. 2. Easy maintenance. ‘I don’t have anything in the house that I can’t wash. That’s what’s nice about things like our sofa. It’s designed to survive life’s mistakes. It’s 10 years old and some stains just don’t come out, so we’ve bought new covers. 3. Take it easy. The family’s sofa has wheels – and so do lots of other bits of furniture. ‘I add wheels to old boxes I find, and to chests and chairs – anything that will be easier wheeled about,’ says Paula. The kids’ toys are stored in a chest with wheels in the living area, so they just push it to wherever they want to play. 4. Get the kids involved. The children do their chores – it’s part of living as a group. They have cards detailing what they have to do each day. The kitchen is robust and can handle them playing. Footstools make things accessible, and there is a calendar for everyone to write on.